GREENBURGH, N.Y. -- New York Rangers forward Martin St. Louis said Monday he doesn't know what his future holds, including if he would be playing hockey next season. St. Louis, 39, will be an unrestricted free agent on July 1. He spoke with reporters three days after the Rangers lost to his former team, the Tampa Bay Lightning, in Game 7 of the Eastern Conference Final. "As you get older, you always think about the following year, the next year," he said. "For me right now, of course I want to play. I'm not sure which direction this team is going to go in either, so it's tough to comment. I've been blessed to play parts of two years here for a great organization and we'll see where that takes me. The opportunity to play for a Cup last year and one win away again this year … it's an experience I'll never forget." St. Louis has 22 goals since being traded to the Rangers prior to the 2014 NHL Trade Deadline. After scoring eight goals in the 2014 Stanley Cup Playoffs, in which the Rangers lost to the Los Angeles Kings in the Stanley Cup Final, his production slipped in 2015. St. Louis, who turns 40 on June 18, had one goal in 19 playoff games. "I'm going to be 40 in two weeks. I just want a chance to reflect here, think about it and we'll see," he said. "It's a couple of days from being knocked out. I'll get a chance to reflect and see where that takes me." The 16-year veteran spent parts of 13 seasons with the Lightning from 2000-14 and won the Stanley Cup in 2004. He was the captain in 2013-14 before he was traded, and is the franchise leader in points with 953 in 972 games. Not making the Cup Final was tough, but losing to the Lightning also hurt. "A lot of guys that I played with last year. A lot of friends on the other side." St. Louis said. "It's tough to see them knock you out, for sure." Coach Alain Vigneault said he spoke with St. Louis about his future. 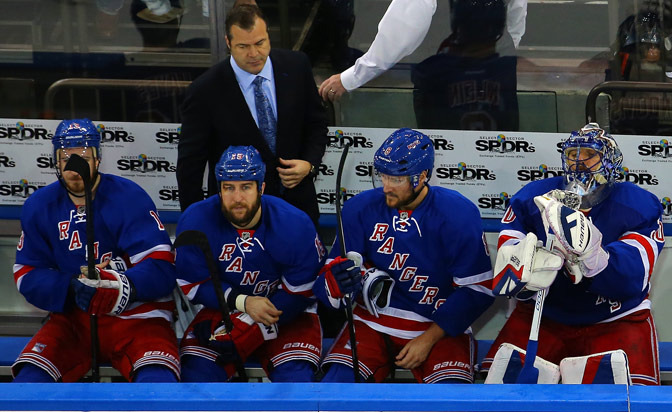 "Marty has been a great player on this team, leadership-wise, example-wise," Vigneault said. "He wants to take a little bit of time at this moment to analyze this season and see what he wants to do. That being said, from our end, we need to know where the cap is going to be. He's going to think about it, we are going to find out where we are money-wise and go from there."